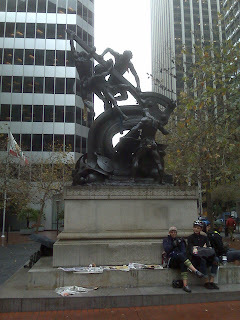 Simply called "the statue", one of the three main hang out spots for bike messengers downtown during the day. Hard to see, but somebody put neckties on the dudes over the weekend. Seated are Ducky from Spirit and Wendy from No BS. Today was overcast and chilly till about two. Usually I don't have too much time to sit around for long stretches but today was slow. I think people have already left town for Thanksgiving. 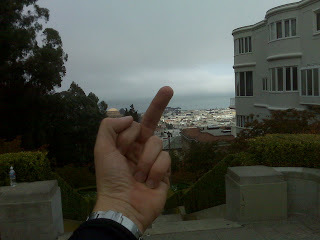 Even though I think I did less than 15 tags, I still made three separate trips from downtown all the way out to Pac Heights. One to 2880 Broadway, one to 3080 Pacific and a third to 39 Mesa in the Presidio. The Marina is a ghetto for rich people.